Subsea Lighting System – Identification of diver umbilical route, the SLS5000 was designed primarily to illuminate saturation excursion dive umbilicals. The fibre can be easily retrofitted to existing umbilicals and at 5mm diameter is afforded significant protection from the other hoses and cables in the umbilical. Systems have been in operation in the North Sea for over 2 years. The SLS5000 is a single source operational to a depth of 500m (50bar) The system requires 12-24V DC (7W) and is a sealed module with pressure relief valve built in. 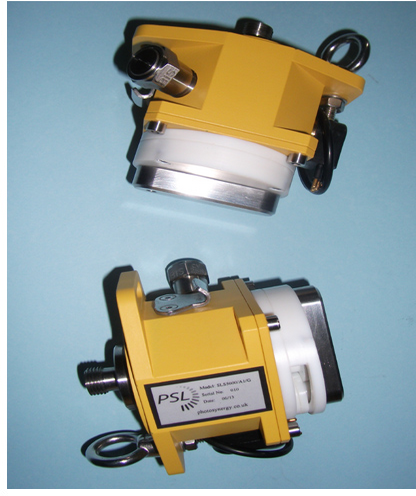 Power is supplied via industry standard mini-series subsea connector and the fibre interconnect is via a patented Optical Pozi-Lock. There is a choice of 3 light output colours is available: green, blue and white. There is an option for a non-penetrating switch which has the facility for ON/OFF/Flash*. A separate sealed battery option is also available which provides 3 hours of continuous operation or 12 hours when used in flash mode. A fourth colour red is available for near surface operation or deck type applications. The SLS5000 can be hard or flexibly mounted and connected/disconnected from power and umbilical in <2min.